Pichavaram, world’s second largest mangrove forest is located in Cuddulore district of TamilNadu. The nearest town is Chidambaram, 15 km away from Pichavaram. Pichavaram mangrove forest is located between two prominent estuaries, the Vellar estuary in the north and Kollidam estuary in the south. 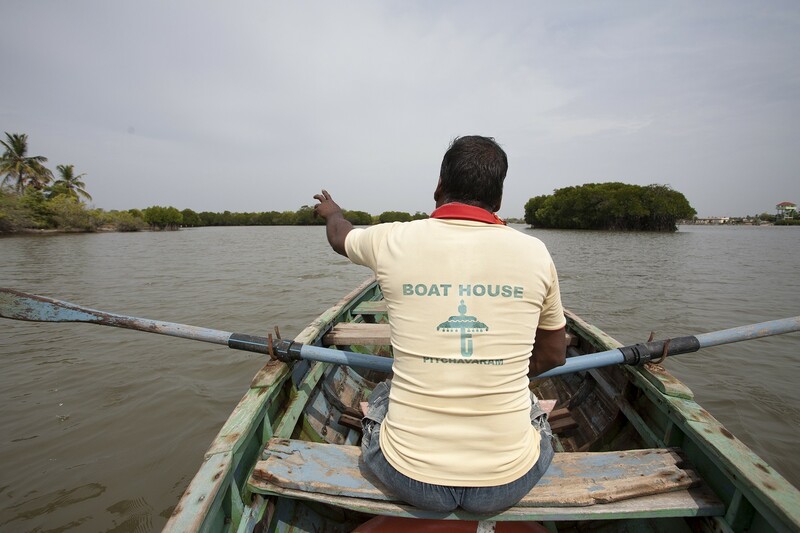 The backwaters are interconnected by the Vellar and Kollidam river systems and offer abundant scope for water sports such as rowing, kayaking, and canoeing. 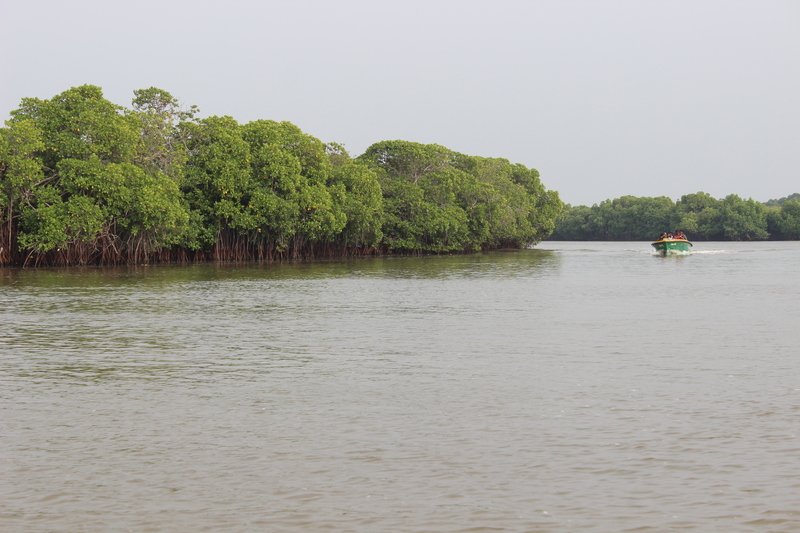 It is a well-developed mangrove forest, which consists of small islands. You can hire a rowboat or motorboat according to your preference and group size. A rowboat is suggested as it can go in the narrow canal and well inside the forest, while the motorboat will cruise only on wide area losing all the pristine areas of the forest. If you hire a rowboat, you can have a chance of rowing by negotiating with the boat operator and can row for a little distance and take pictures. When you cross half-way from the starting point, the boat operator will ask you to pay him in addition to the charges you paid if you wish to go further inside. If you wish, you can pay him additionally, he will take you through the dense forest where other boats won’t go. Some of the locals are seen with the long stick fishing in the waters and walking slowly in the waters. There is a watchtower beside the entrance, which gives a mesmerizing view of the mangrove forest. There is a canteen for refreshments. Restrooms, waiting area, and parking space are also available. Where to stay in Pichavaram? Not many hotels are present near the forest. Pichavaram Adventure resort is located nearby the mangrove forest which offers A/C rooms, cottages, and dormitories. This resort is a part of Saradham’s group of hotels. You can contact them at Adventure Resort. The nearest city is Chidambaram where you can find plenty of hotels. Some recommended hotels are Vandayar hotel, The Grand Park in the budget category and Lakshmi Vilas on the Deluxe category. You can visit Poomphuar an erstwhile port city called as Kaveri Poompatinam serving Chola empire. Tharangambadi, known as Tranquebar was once a Dutch colony. Beach on the Bungalow by Neemrana hotels is one of the most noteworthy hotels in that area which offers good ocean view rooms. Natarja temple in Chidambaram is a Hindu temple dedicated to Lord Nataraja which was built in 10th Century. The temple wall carvings display all the 108 karanas from the Natya Shastra by Bharata Muni, and these postures form a foundation of Bharatanatyam, a classical Indian dance. Pichavaram is 250km from Chennai, the state capital and 200kms from Tiruchirapalli and well connected. The nearest railway station is Chidambaram.